The subdued, not-quite-monochromatic palette is the perfect counterpoint to this graphic memoir featuring a young boy who has to learn at an early age the difficulty of loving a mother whose addiction prevents her from loving him back in a safe way. I finished reading it in one breathless sitting, marveling at how an author known for making readers laugh could now bring me to tears with his own personal story. Full of depth, complexities, hard truths, but also hope, this graphic memoir definitely fills a void. 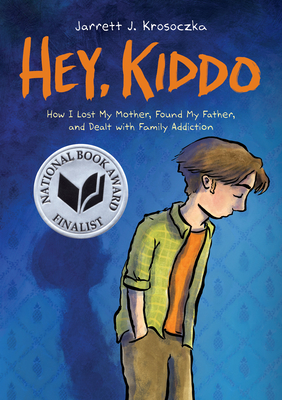 It’s no wonder that Hey Kiddo is now on the longlist for the National Book Award.